As the Yankees wrap-up their search for the first manager of the post-Torre era they will begin to turn their attention to resigning their potential free-agents. Among the bigger names of players the Yankees are at risk of losing are Jorge Posada and Mariano Rivera. Andy Pettitte, Alex Rodriguez, and Bobby Abreu are other potential free-agents, however, Pettitte has a player option, Arod can opt-out, and the Yanks hold a team-option for Abreu. Bringing back Posada, who has been with the team since he was drafted in the 24th round of the 1990 amateur draft, is one of the Yankees biggest priorities right now. A source told the NY Daily News that the Yankees are, “going to be very competitive,” in bringing their 36-year old catcher back and are supposedly set to offer him a three-year deal in the $40 million range. 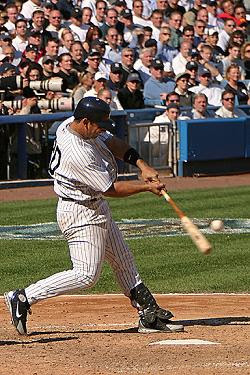 That might be just an initial offer as the Detroit Tigers just resigned Pudge Rodriguez at $13 million for next year and his numbers are well into decline, while Posada just came off the season setting many career highs hitting .338 with 171 hits and 42 doubles. How much money he will command may not be the only challenge the team will face. After the year Posada has had, he will be very attractive for other teams and they will try to do what they can to lure him away from the only team he has ever known. If the Yankees miss-out on bringing Posada back, replacing him will not be easy. They will not be able to quickly replace him from within the organization and the free-agent market is looking very bare. From within the organization, the Yankees could attempt to resign Jose Molina and make him the starter, but he has never been a starting catcher and his career .243 batting average makes him more suited as a backup. Replacing him with a minor leaguer is not an option as they have nobody in their system that is close to being major league ready. That means the Bombers will have to begin searching outside of the organization if they are forced to replace Jorge. Choosing from among the top free-agent catchers is no picnic. In a completely bare free agent catching market, Paul Lo Duca may be the best option, possibly the only option depending on how you look at it. Could the catcher from Shea even be a consideration though? Only if they are desperate. Just slightly younger than Posada, Lo Duca’s production has dropped off quite a bit recently, posting a lower on base percentage, slugging percentage, and appeared in fewer games than any year since 2000. The last way the Yankees could try to replace Posada would be through a trade, but the issue here is finding someone willing to trade a catcher. All around the league catchers are at a premium. Last year the Texas Rangers could have gotten a lot when they were looking to get rid of Mark Teixeira and the package they considered the best included young catcher Jarrod Saltalamacchia, which goes to show the premium baseball is putting on catchers lately. If you are going to trade for one you better have something significant to offer. Jorge Posada made his major league debut September 4, 1995 and has given his all since then. A $40 million three-year offer is a very good start, but the team should be prepared to offer more if that is what it is going to take to avoid the chasm which would be left behind in his absence. Rob Abruzzese's articles and more NY Sports can be read @ Hot Stove New York.